T.P. Mills: a name synonymous with expertly crafted putters for over 50 years. I had the good fortune to acquire my own T.P. Mills putter about eight years ago. Since that time, rarely has this not been the putter I reach for and have the greatest confidence in to get the ball in the hole. He is considered the father of the milled putter. 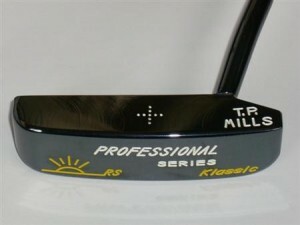 He was the first one to paint a putter head black, making a sharp contrast with the white golf ball. He helped design the famous "flanged blade" BullsEye putter from Acushnet. He was the first to mark the true "sweet spot" on the putter face and provide a sighting dot on the top of the putter head. If you think about putter designs today, you can see that most of these are now standard features in the golf industry. While Mills started work on his own, some of his most notable( and widely known) designs were developed for the Spaulding company. Mills putters are generally simple looking, but loaded with subtle design features that would benefit nearly every golfer. Start with using soft carbon steel, for exceptional feel and response. Then add a subtle heel shafted hosel with (most often) a simple 1/4 offset. A no-nonsense flange to add bottom weight and distribute it throughout the head with a slight nod to toe-weighting -- all the better to take advantage of the natural swing of the putter head in motion. There was nothing about this putter taken for granted -- no part of it not thoughtfully engineered for maximum performance and playability. T.P. Mills putter models are simply numbered, from Model #1 on up. Surprisingly, older models can be found today on eBay and elsewhere at bargain basement prices -- in many cases, less than their original price. At the other end of the price scale, a bit of a "cottage industry" has sprung up with these older, collectible models, where they are being lovingly refurbished with beautiful and unique finishes into true works of art. With over 20 professional tour wins worldwide since 1999, T.P. Mills putters continue to prove their validity and success at the top levels of international competition.